This adjustable microscope is perfect for exact viewing. Two separate on/off switches allow for individual control of the Ultra-Lite fluorescent transmitted light and reflected halogen light. The reflected halogen light also has a dimmer control and an adjustable light angle for precise lighting needs. 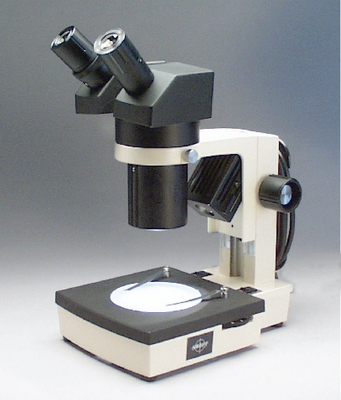 This microscope also features a 360° rotatable head for viewing from any angle, a diopter adjustment in the left eyetube for custom eye focus, locked-on eyepieces with eye guards for comfortable viewing by eyeglass wearers, interpupillary adjustment, a slip clutch to protect optics and gears, a fixed-stage plate, and a hanger in the back for wrapping the power cord. A smoothly rotating turret houses the objectives for easy magnification changes. A three-way illumination control lets users select reflected light, transmitted light, or both. Dual-magnification options are 1x and 2x objectives for 10x and 20x magnification, 2x and 4x objectives for 20x and 40x magnification, and 1x and 3x objectives for 10x and 30x magnification. Ordering information: The microscope comes with a c-wrench, manual, and dust cover.